How to Get There: From Rome - Approx. 645 km - Via A1 to Naples. By car: from the North, take highway A3 to the exit for Bagnara di Calabria and continue towards Gambarie di Santo Stefano d'Aspromonte. From Reggio Calabria, take the freeway SS n. 184 Gallico-Gambarie. By train: Villa San Giovanni and Reggio Calabria are the closest railway stations. In Brief: The Aspromonte National Park has only recently been established. The complexity and the nature of the territory have not permitted the Park Authority to make rapid progress with setting up sufficient structures to cover the entire area. However, please note that three of the seven structures built including area offices, museums, ecological areas, hostels, etc., are accessible to visitors with mobility limitations such as elderly people, children and people with disabilities. Itineraries: There are many itineraries that one can follow in the area, simply by following one of the well-marked forest paths. 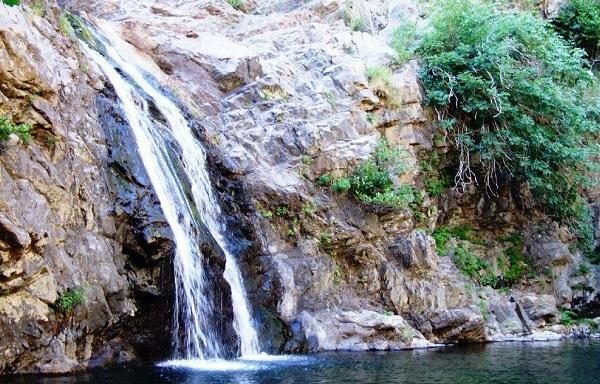 Additionally it is highly recommended visiting the Montalto and Maesano waterfalls. One path leads to the steep Pietra Cappa rock, passing through an ancient sweet chestnut woods on the way. Another one leads to Lake Costantino, starting from San Luca. 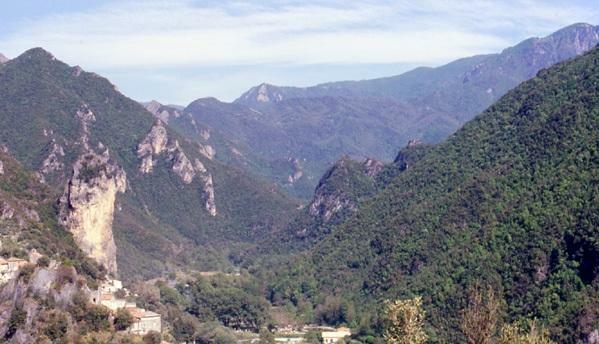 Park Outline: The establishment of the Calabria National Park (in 1968) originally seemed to be a positive interruption in the long period of Italy's lack of interest in national parks (the last preceding opening was Stelvio in 1953). Not entirely without reason, environmentalists saw it as a mere facade that did not increase the amount of protected land by a single metre (it was originally divided into three pre-existing State-owned forests, as well as between Sila and Aspromonte). 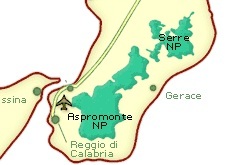 After much controversy, the mistake was corrected establishing Aspromonte as a national park of its own right (successively instituted by decree in January 1994), covering the entire area. The territory of the Aspromonte National Park is entirely located within Calabria, the southernmost part of the Italian peninsula facing Sicily. It is an enormous pyramid-shaped rock formation that rises steeply from sea level to a summit of 1955 meters at Montalto. It is also the final expanse of the Calabrian Apennines - a term used by geologists to indicate the mountainous region located between Sila, Serre and Aspromonte - highlighting the fact that these mountains, composed of crystalline rock and granites, have a different geological origin to the Apennines that are of sedimentary origin with a high percentage of limestone that stretch all the way to Southern Italy with the Pollino and Orsomarso mountains. 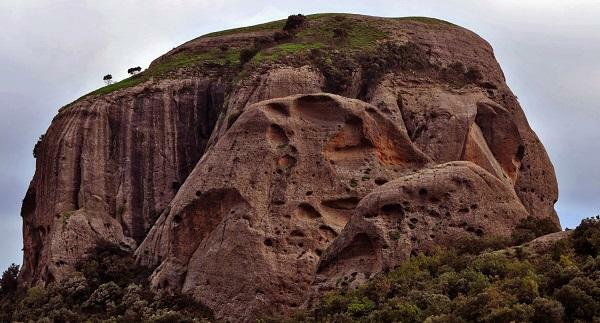 The highest elevation of the rock formations is characterized by a series of tablelands; the slopes fall away into the sea with giant terraces, called plains or fields, separated by steep cliffs. Another characteristic is that of sharp pinnacles alternated by gorges that cradle rivers or waterfalls. The torrents of Aspromonte bear large beds of debris that are dry for most of the year, but that can suddenly become flooded with water during winter storms. 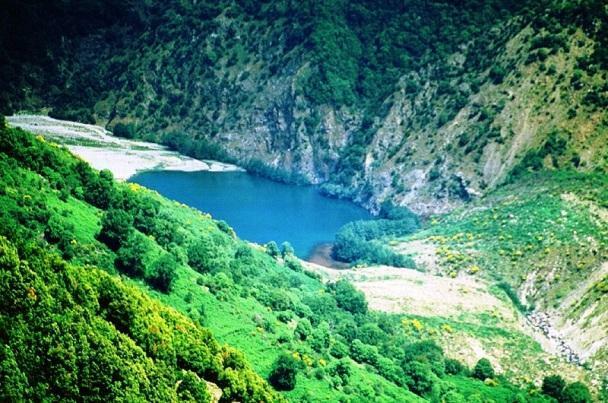 Following the course of the Bonamico Torrent, for example, it is possible to reach Lake Costantino: one of the few European lakes originated by a landslide that blocked the waterway (the difference between this and other lakes that were formed in this way, such as Lake Scanno, is that Lake Costantino does not date back to geological times but to more recent times. Aspromonte is an area rich in rivers that run through the back of the massif from the high valleys to the sea. 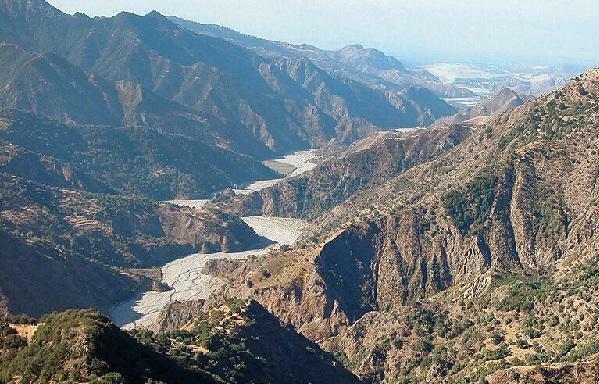 These numerous rivers give life in some situations to spectacular waterfalls located throughout the territory, some can be visited at any time of the year, while others torrential character are present only during the winter / spring when they are fed by the rains or the melting of the snow and then disappear during the summer. 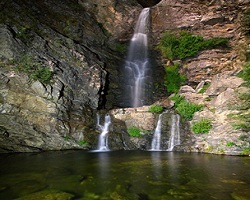 Some of the water falls located in the park are: Waterfall Mundo and Galasia. One river valley of particular beauty is the Valley of the Ferraina Torrent where the rocks that have been shaped by the wind and the age-old oaks that have been struck by lightning offer a landscape that is fascinating, unique and irreplaceable. Wildlife: The large mountain-top woodlands of Aspromonte are made up of Beech trees or of a mix of European larch (a pine that is characteristic of the Sila and Aspromonte region) or even Beeches mixed with Silver firs (which was a very common tree in the Apennine woodlands centuries ago, but is now very rare). At lower elevations Oak trees are present and near the seashore there are Mediterranean shrubs such as Oleander and Tamarisk which grow along the rivers. 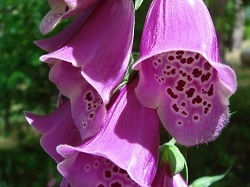 Among the herbaceous plants are the giant and rare Ferns of tropical origin, the Woodwardia radicans, and the Digitalis purpurea, an extremely poisonous plant with large red flowers. Aspromonte is the only place on the peninsula where this plant can be found (the species is widespread in Sardinia and Corsica). Concerning animal life in the Park, the most important presence is the extremely rare Bonelli's eagle (less known than the more common Golden eagle); the number of specimens present in Italy can be literally counted on one hand. Wolves, which had disappeared in the '50s, have recently returned to the mountains. 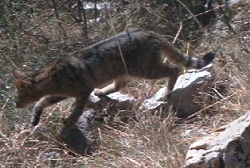 There is also apparently a relatively large population of the elusive Wildcat in addition to numerous Wildboars and Porcupines. Other interesting species are the Black woodpecker and the Eagle owl, in that both species are quite rare to Italy. It is worth noting that, in the spring, the Messina Strait is a very popular point of transit for birds of prey migrating from Africa towards Europe. This makes Aspromonte an exceptional observatory for bird lovers. History and Culture: The Aspromonte area is a land that has always had close cultural ties with the Eastern Mediterranean, ties that are seen in the art, architecture and popular traditions. The history of the territory of the Aspromonte region is an ancient one. Traces of a Neolithic past can be found all over the Park grounds, especially in the area of Bova. The Via Grande, a ridge path that links the Massiccio dell'Aspromonte with Serre, has also prehistoric roots. This path has been used for thousands of years and it remains visible to this day. Greek colonization in the 7th century spread throughout the Ionic area, bearing signs of the broad civilization and culture that in Southern Italy was called Magna Grecia. 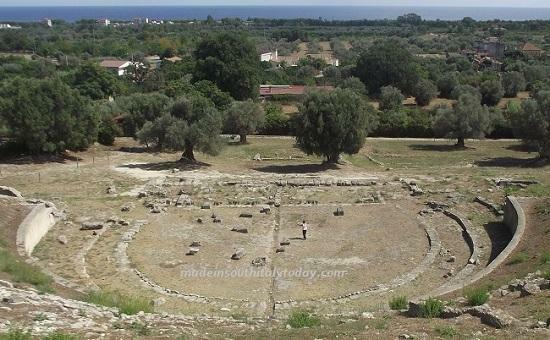 Locri, near the Park's borders, is home to the remains of the Sanctuary of Persephone and of a ring of walls. Fortifications and ditches found in the archeological area of Passo del Mercante date back to the Roman era. Between the 7th and 12th centuries AD, the territory of the Aspromonte witnessed new migrations of Greek peoples. These more recent cultural crossovers were kept alive both in the spoken language, the so-called Grecanica, used in a few areas of the southern tip of Calabria such as Bova, Roccaforte del Greco, Roghudi, Condofuri, as well as in the particular design of some important elements of the landscape. At Pietra Cappa, in the town of San Luca, high rounded cliffs filled with caverns and dominated by Byzantine monasteries bring to mind the Meteore of Cappadoccia. 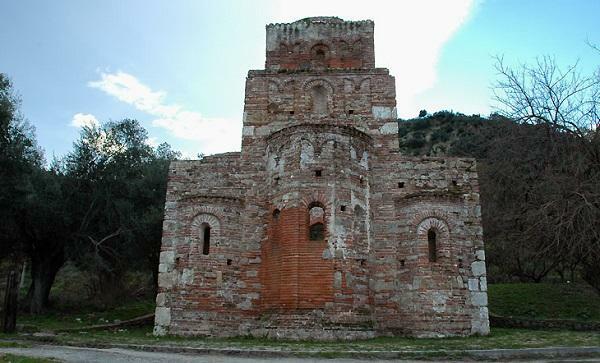 Beautiful Norman architecture is also worth noting, such as the Church of Santa Maria Tridetti in Pietro Castello, the Sanctuary of Polsi in Bagnania Calabria, the splendid Cathedral of Gerace, the Churches of Santa Maria del Mastro, San Giovenello, and Saint Francis. A final word must be said on the residential area of Cittanova with its radiant 18th century urban plan. Typical Products and Craftwork: Numerous typical products are produced in the area, the terracottas, ceramics, hand woven fabrics and wrought iron being particularly noteworthy. 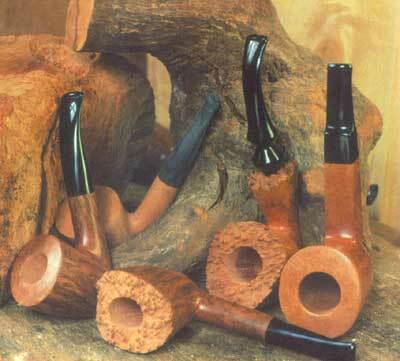 Special mention goes to woodwork that ranges from simple kitchen tools (spoons, bowls) to exquisite pipes carved from the wood of heath trees. Also characteristic to the area, especially at lower elevations, are the fragrant bergamot and jasmine orchards that produce delicate essences used in the perfume industry. Traditional mountain dishes include macaroni with pork or goat meat sauce, timbales, fried tripe with hot pepper, cold cuts such as soppresata and sausages. Desserts include gelato cakes as well as toffees made with almonds, honey or pine nuts.